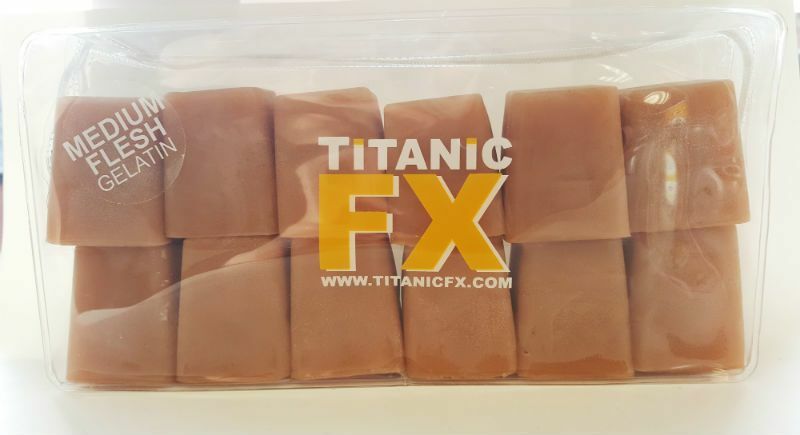 Titanic FX Prosthetic Gelatin is an ideal medium for any makeup artist for gaining invaluable understanding and technical skills for working with 3D prosthetic media. These gelatin nuggets are pre-mixed, pre-coloured, pre-flocked and ready to melt down for use in prosthetic make-up / props. They are also reusable and of food/medical grade. Titanic FX have developed this expert grade quality of Gelatin, specifically designed to mimic the colour and texture of human skin, it blends flawlessly with the skin giving a professional finish on prosthetic wounds and make-ups. It has been tried and tested on set in LA on Criminal Minds: Beyond Borders and The Last Ship, withstanding high temperatures and long shoots on set with excellent results. It is available in a variety of colours from Light, Medium, Dark and Clear skin tones and Blood, Muscle and Fat body tones. 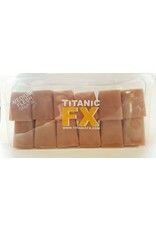 Titanic FX Gelatin Nuggets can either be cut up into smaller amounts or heated as a whole. Note that cutting up will lessen the heating time. Heat in a double boiler (such as a waxing pot) or place in a microwave. Be sure to stir well and often to avoid boiling the product. Note: Boiling gelatin will weaken the structure of the product. Once the Gelatin has melted into a liquid, pour into your (pre-released) mould and allow to cool. You can also place your mould into a fridge to speed up the cooling process.